Albarn: "we've got a reason to exist"
After weeks of speculation, Blur have confirmed a reformation. The four original members have announced a headlining show at London's Hyde Park next summer - their first gig together since guitarist Graham Coxon quit in 2002. "It just felt it was right again," frontman Damon Albarn told NME. "It somehow feels like there's something for us to do again, we're not completely useless or pointless, we've got a reason to exist." 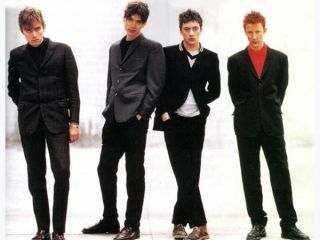 Coxon agreed, explaining that they're merely "making public what's been going on a little bit privately. For the benefit of the fans and those interested we can say that something's on the cards." There's no word yet on plans for new material and the Hyde Park date on 3 July 2009 is the only confirmed performance, as Albarn explained: "We'll do something in London because that seems sensible. But we're also playing in other parts of the country working up to there." If the lads can find time between their numerous side-projects and Albarn and Coxon can keep the peace for long enough, expect a well-overdue album to follow soon.